ActBlue gives you the tools to create targeted email lists without having to write a line of code! 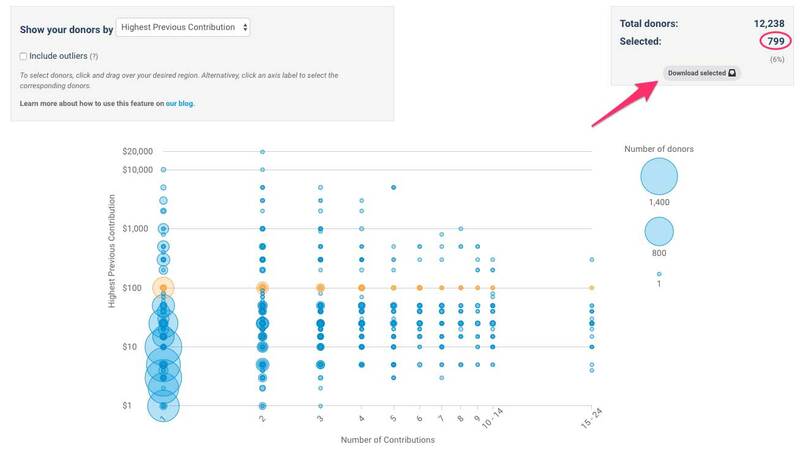 The "Donor Segments" tab on your Dashboard allows you to analyze contributor data by tracking highest previous contributions and total contribution amounts from individual donors. You can select groups of donors based on their contribution histories and download their email addresses and contributor information in just a few simple steps. 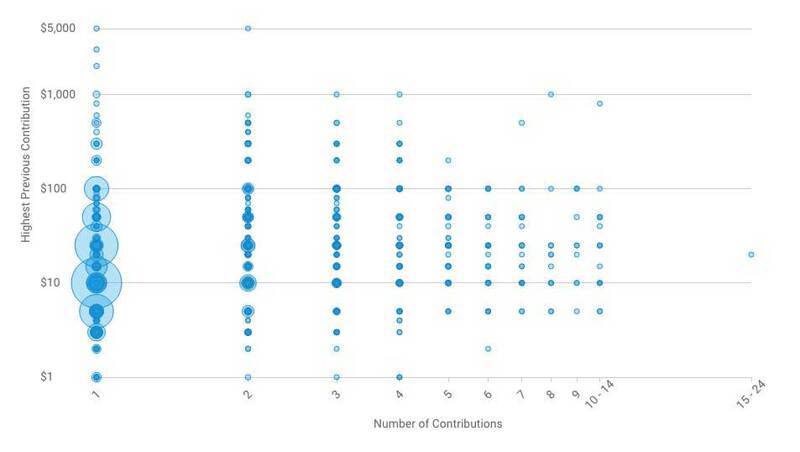 This is a visual representation of your donors according to their highest previous contribution amount. 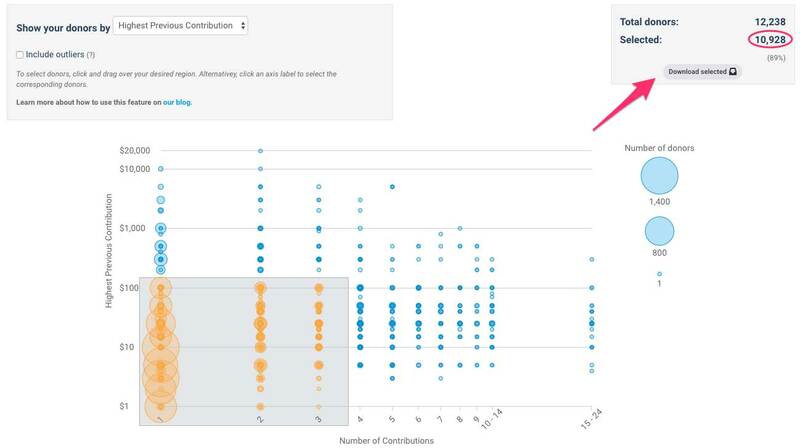 To view a different set of data, you can opt to show your donors by total contribution amount at the top of the page. You can also opt to show outliers (people who fall outside the scale of the graph), if you want to include those donors in your targeting. You can use the chart in the donors tab to segment your email list. For example, you can target all the donors who have given donations under a certain amount on multiple occasions. Or, you could target donors who have contributed a large amount, but only donated one time. You can download a CSV of the email addresses and the corresponding contribution data from a column, row, or selected range of the graph. Click a dollar value or a number of donations to highlight a row or column. You’ll see the grey box in the corner with a breakdown of the total number of donors represented in the chart as compared to the amount of donors you’ve selected. Then simply click “Download selected” in the upper right-hand corner, and you’ll have a CSV of those donors you want to target. To select a custom set of data, drag your mouse to draw a box around your desired values, then download the data in the same way. This allows you to do some pretty sophisticated targeting without needing to do the backend work. You can easily target donors based on their highest previous contribution and frequency of donating without knowing a line of SQL. Please note that values on the y-axis are rounded. For values from $1 to $5, amounts are rounded to the nearest dollar. For $5 to $25, they are rounded to the nearest $5, and from there on, tens are rounded to tens, hundreds to hundreds, and so on. This makes the information easier to use and minimizes visual clutter. Contribution numbers on the x-axis above ten are rounded to the nearest ten. It’s unlikely that you’ll have contributions ranging in the hundreds, but in that case they are rounded to the nearest hundred.